In 1980-93, the Bialowieza population of Wolves survived and increased, most probably due to a constant immigration of Wolves (on average, two immigrants per year) from the vast forests adjoining BPF to the east. ....In this paper we analyse a nearly 150-year record of population dynamics of Wolves in the Bialowieza Primeval Forest. Due to the status of BPF as a royal hunting forest of the Polish kings (fifteenth-eighteenth centuries), and then the Russian Tsars (nineteenth century until 1915), and special protection measures in the twentieth century, Bialowieza Primeval Forest is the best preserved lowland forest in Europe. From the fifteenth to the end of the eighteenth century, BPF was protected as the royal hunting forest of Polish kings. In the nineteenth century and until 1915 (under Russian rule), it became a protected forest for royal hunts of the Russian Tsars....In 1921, the most valuable and nearly untouched oldgrowth located in the heart of BPF was proclaimed the Bialowieza National Park. (In the 1970s this Park became UNESCO's Man & Biosphere Reserve and World Heritage Site.) The remaining part of BPF underwent economic exploitation of timber until 1941. In 1945...the new state border between Poland and the Soviet Union (Belarussian SSR) divided BPF into two parts with different management rules. In 1981, this border became a real barrier to ungulate movements, because the Soviets built a 2.5 m.-high wire fence along it. It was proved that Wolves and Lynx could cross this construction. The oldest document regulating the rules of hunting Wolves in Bialowieza Primeval Forest is the Management Plan of Primeval Forests in the Brzesc Region by J. Szczepanowski in 1796. It stated that foresters watching the forest and game were not allowed to hunt for any game except for Wolves and, to do that, they were permitted to keep five hounds. The pelts of killed Wolves were sent to the Treasury. This and other documents provide evidence that it was an old custom to hunt Wolves in order to prevent too much damage to the livestock of local peasants (before the end of the eighteenth century, the vast forests of Bialowieza were practically not settled, but they were encircled by small villages). In 1846, in the whole Grodno [province]...Wolf control was commanded and bounties (3-4 roubles per Wolf) were paid whenever the ears and tail of a killed Wolf were presented to the local officers. In 1847-52, in the region embracing BPF, bounties for 210-220 Wolves were paid. This campaign reduced the number of Wolves, but did not exterminate them. When the Tsar Alexandr II came to BPF for a royal hunt in 1860, within a few days 17 Wolves were driven from various parts of the Forest to the large hunting enclosure. Detailed game-management reports from 1903 to 1914 are not available, but it is known that extermination of Wolves as a measure for protection and promotion of ungulates was conducted until 1915, when the German army invaded Bialowieza. The years of World War I (1915-18), the October Revolution (1917-19) and the Polish-Soviet War (1919-21) were times of political chaos which were disastrous for the forest and ungulates, but good for predators. Wolves recolonized BPF very quickly. In 1919-39, the whole BPF was again under Polish rule. Soon the Forest became a place of diplomatic hunts for the Polish president, invited politicians and monarchs. Wolves were valued trophies of the hunts, and, after 1928, a subject of more intense reduction. ....After 1945, when the new Polish-Soviet border divided BPF, game-management rules were different in each part. In the Belarussian part, since 1946, the Wolf has been intensively fought against as a pest. Hunts with "fladry" have been the dominant method of hunting, supplemented by sit-and-wait hunts at carcass bait. The most intense persecution, aimed at complete extermination, took place between 1946 and 1971. Year-round hunts for Wolves are still practised. In the Polish part, intense Wolf control...was imposed in 1946-65, as in the rest of Poland. In the 1980s, after the Wolves recolonized the Polish part, they were hunted for sport in rather small numbers. Since 1989, the Wolf has been protected in the entire Polish part of BPF. During the last 150 years, the density of Wolves in Bialowieza Primeval Forest varied greatly. Periods of high density (around 1820-40, 1870-80, 1925-30 and 1945-48) occurred after uprisings and wars....Maximally, in various years, from 7.2 to 9.1 Wolves/100 km2 were recorded. Declines of Wolf numbers and prolonged periods of lows were always caused by deliberate persecution by humans. Very low densities of Wolves occurred in 1882-1915 and 1958-72. In the last decade, the fact that Wolves were little affected by humans in the Polish part (40% of BPF area) saved the Wolf population from eradication and even allowed for a slow increase in numbers despite the very intense hunting on the remaining 60% of BPF area (the Belarussian part. )....In the 1990s, the density of Wolves was about 40% of the highest densities recorded. The increase phases of Wolf population...were due to both reproduction of the local survivors and immigration (although evidence for immigration is circumstantial only). 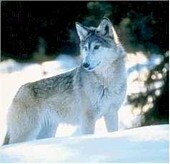 The latter process was especially important after 1915 and 1970, when practically no local Wolves survived. Data from 1980 to 1993 allowed for detailed analysis of the influence of heavy hunting pressure on demography, social structure, and general performance of the Wolf population. In the Belarussian part of BPF, where Wolves were shot year round, there was a clear monthly variation in intensity of Wolf hunting. Seventy per cent of all Wolves killed by people were shot in December, January and February during traditional snowtracking-driving hunts with "fladry". Nine per cent of all Wolves killed were pups taken from their natal dens in May-June. ....[H]unters shot one or two Wolves during a drive hunt, irrespective of the pack size. Thus, the lower number of Wolves in a pack, the lower the chances of a single Wolf to survive. In packs of five to seven Wolves, 72% escaped...and in packs of three to four Wolves, 55% of individuals escaped....It means that after a drive hunt, a pack of three to seven Wolves lost one or two members. Only 21% of single Wolves and 42% of Wolves in pairs came out alive....Many survivors were, during the course of the same winter, driven again. By the end of winter, some packs were eradicated and others lost some members. In the Belarussian part of BPF, the mean pack size in the late autumn was 4.0 Wolves (a pack of four was the most common). By the end of the intense hunting season the mean pack size was 2.3 Wolves, pairs occurred most often, and a high proportion of single Wolves (on average 14% of Wolves) occurred. In contrast, data on pack size in the Polish part of BPF, where no hunting took place, showed that packs were on average 4.2 and 4.3 Wolves from November to January, and their size declined somewhat (to 3.6) by the mating season in February, when many pairs were temporarily separated from their packs. The share of lone Wolves did not exceed 5% of all individuals, and some of them were wounded survivors of the hunts conducted in the Belarussian part of BPF. We...predicted that, on average, 6.25 young per mother were born (range 3-8). The rate of mortality was highest at the early stage of pup life. If only the natural factors are considered, 3 months after birth, the mean litter size was 3.1 (50% mortality). Only 2.6 pups/litter survived by November when the winter hunting season began (58% mortality), and 2.2 pups/litter reached 1 year (65% mortality). However, 11 out of 40 litters recorded were robbed by humans; 39 of 134 pups (29%) were lost due to this factor. Therefore, the actual survival of pups was lower by 29%, and it was 2.2 pups/litter after 100 days and 1.8 pups after 200 days, i.e. when the winter hunting season began. Only 1.6 pups/litter would reach 1 year (74% mortality). In the Belarussian part alone, the survival of pups was still lower, because many juvenile Wolves were shot in winter. Because 35% of shot Wolves are juveniles, we estimated that only about 15% of pups (0.9 pup per litter) would reach 1 year. In the Polish part of BPF, where only negligible hunting for Wolves occurred in the 1980s, breeding of local Wolves, despite low survival of pups due to frequent den robbing by humans, gave a surplus of individuals (annually about four Wolves) that had to leave the Polish part of BPF. In the Belarussian part, where heavy hunting took place every year, the numbers of Wolves were lowest in April before the birth of young. Breeding could not compensate for mortality. Annually, six Wolves per year must have immigrated to the Belarussian part of BPF. There was an unrestricted exchange of Wolves between the Polish and Belarussian parts, so the "surplus" Wolves from the Polish part could reinforce the heavily exploited Wolves in the Belarussian part. In the whole BPF, in 1980-93, on average 32 Wolves were recorded on 1 January and 22 (70%) survived until early April, when the Wolf population reached the seasonally lowest numbers. In May, soon after pups were born, an average 72 Wolves lived in BPF, but a month later, these numbers had already declined to 44 (by nearly 40%) due to natural and human-caused mortality of pups....Annually, two Wolves must have immigrated to BPF from the surrounding forests....Two undoubted cases of immigration (both from the east) were recorded in the Belarussian part of BPF: a pack of five Wolves in February 1985 and a pack of 11 Wolves in December 1989. During the last millenium, European Wolves coped with increasing human pressure and humans believed they had to cope with continuous danger from Wolves. In some parts of central, eastern and southern Europe, with vast forests and a relatively low density of human population, Wolves have survived and maintained their ancestral habits. Unfortunately, most of the copious literature on Wolf ecology in the European part of the former Soviet Union, and from other countries (this paper included) has two weak points: (i) scientific data were collected as a "side activity" of Wolf control programmes, and (ii) areas subject to studies were not forgotten wilderness sites, where Wolves live more or less on their own, but they were protected areas (mainly "zapovedniks" or game reserves in the former....) where Wolf control was a compulsory rule not only during the nation-wide Wolf campaigns but continually....In recent years, because of a breakdown of the former system of forest and game management, Wolves received much less attention from humans in the exploited forests than in the forests with an official protection status. Thus, the functioning of the Wolf population shown in our paper is not fully representative of the entire situation of Wolves in the deciduous forests of Eastern Europe....At present, killing of Wolves in the Belarussian part of BPF is far more intense than in other large forests of Belarus. ....[I]n the Polish part of BPF...both non-official and official protection of Wolves in Bialowieza were always ahead of such decisions in Poland as a whole. In Bialowieza (the Polish part), Wolves became fully protected in 1989, whereas in the whole north-east Poland they got a status of a protected species only in 1993. Despite these specific features of Bialowieza Primeval Forest, we believe that this paper reveals very typical features of the ecology of Wolves in Europe, especially their performance under human pressure that varied from negligible to severe, and the consequences of human impact on Wolf populations. ....Throughout winter, Bialowieza packs lost, on average, two members. In a few cases of severely persecuted packs, the two or three survivors broke apart and the pack ceased to exist. The most intense winter hunting (in February) coincided with the mating season. Pups were most often born to a "pack" of two Wolves. It was also observed that a lone female had to care for her young. Litter size at birth was high, as typical for Wolves in Eurasia, but survival of pups was very poor. Harrington et al. (1983) showed that, when prey was abundant, survival of pups until December was positively correlated with the number of helpers, i.e. yearlings which remained in a pack and participated in bringing food to young. We think that because packs were very small, malnutrition was the primary cause of the natural mortality of pups in the Belarussian part of BPF. Moreover, a strong local tradition of taking small pups for "pets" (in both Polish and Belarussian parts) or to get a bounty (Belarussian part) further worsened Wolf breeding success. Wolf pups taken by people were kept at farms, in yards, or temporarily even in flats in the...nearby town of Hajnowka. Most of them died very quickly. Some were kept for a few months until their biting, digging, and notorious howling made the owners pass them to someone else or simply let them go. The chances of a released or escaped pet Wolf surviving in the wild are practically none. ....Finding of Wolf dens by people is facilitated by a high "conservatism" of Wolves in their choice of den site, which most likely results from both the use of the same den by one pack year after year, and from the scarcity of good sites in the lowland deciduous forests. For instance, the site near Krynica village in the Polish part of BPF is known to have been robbed of pups in 1975, 1992 and 1993. Mech & Packard (1990) reported that a suitable den site can be utilized by generations of Wolves for centuries. In the forests on Obol River (NE Belarus), dug-outs made and used as shelters by local people during World War II were often occupied by Wolves soon after the war and some of them, subsequently "repaired" by Wolf digging, are still used to this day as breeding dens. Heavy prolonged exploitation causes "rejuvenation" of the Wolf population, a fact reported from Russia in the decades of the most intense extermination of Wolves. Mech (1988) reported that wild female Wolves can still breed at the age of 10 years....In the Belarussian part of BPF, the oldest shot Wolves were 4-5 years old. It indicates that social structure is being broken again and again and a pair...has very little chance to stay together for over 1 year. Many problems remain unknown, e.g. the fate of lone Wolves by early spring after the winter hunting season is over, the participation of young females in reproduction, etc. ....In their struggle for existence, Wolves have several strong points (high fertility, mobility, very flexible social structure and amazing stamina that allows them to recover from gun-wounds, poachers' snares, etc.) But they also have some inherent weaknesses that make them vulnerable to human pressure: vocal activity that allows hunters to localize packs and young, conservative use of den sites year after year and, especially, the "irrational" fear of a loosely hanging barrier of pieces of red cloth which, once discovered by humans a few centuries ago, let them master an effective method of Wolf extermination*. During the last two centuries, Wolves in Bialowieza were four times relieved from human impact and quickly grew in numbers. Such fluctuations of numbers with still increasing amplitude have been the most typical feature of Wolf ecology during the last millenium in Europe. The oldest Polish chronicle has reported that, in 1039 AD, after the ravaging incursion of Brzetyslav, the duke of Czechs, into Poland, Wolves denned in the desolated cathedral of Gniezo, then Poland's capital. In 1939, Wolves in Poland got their last opportunity to thrive. Only recently has there been a chance that Wolves will do well due to rational protection by humans rather than due to human engagement in intraspecific combats. Observations from the Polish part of BPF in 1980-93, when Wolves were little affected by humans, indicated that an increase of Wolf numbers began with an increase in pack size, which was especially well documented in BPF (from a lone Wolf in 1983 to a pack of eight wolves in 1992), and then the number of packs increased. Territorial behaviour of packs and availability of prey are two crucial factors limiting Wolf numbers. Recently, McLaren & Peterson (1994) analysed the population dynamics of olves, Moose, and the growth dynamics of balsam fir on Isle Royale, and found that this three-staged linked system exhibited cycles of 16-18 year periodicity. Labutin (1960) showed that the Yakutian population of Wolves that feed predominantly on the Blue Hare followed the 9-12 year cycles of hare numbers. Would the Bialowieza population of Wolves cycle, if it had been undisturbed by humans? Probably, it would not. The population of Wolves in Minnesota and Yakutia were parts of one predator-prey systems (Wolf-Moose and Wolf-Hare), whereas in the deciduous forests of Europe Wolves used to coexist with three-five species of ungulates....In Bialowieza, Wolves specialized on Red Deer, the dominant species in the ungulate community, but they also prey on Roe Deer, Wild Boar, and Moose. In 1800-90, when Red Deer were absent from BPF, Wolves survived on other ungulates (including European Bison) and were able to maintain high density when human pressure was small. The human-made fluctuations of Wolf numbers in Bialowieza had, none the less, profound consequences for ungulate numbers....In large areas of Europe and Asia, where Wolves were exterminated, densities of ungulates began to grow at unprecedented rates following the eradication of Wolves. Also, the recent recovery of Wolf numbers, that began in BPF around 1970, has been taking place throughout eastern Europe and in Russia. Therefore, it seems that, by each extermination of Wolves lasting long enough to suppress their numbers, humans unintendedly created excellent conditions for recovery of Wolves at their earliest opportunity. Figure 1: Bialowieza Primeval Forest; schematic map of BPF with divisions into forest administration units. Figure 2: Correlation of Wolf numbers in the Belarussian and Polish parts of BPF in 1946, 1950, 1958, 1961-64; correlation of the numbers of Wolves killed annually and the numbers of Wolves in the whole BPF in 1946-71. Figure 3: Long-term dynamics of Wolf density and hunting harvest in BPF (1847-1993). Figure 4: Dynamics of Wolf numbers (surveyed by snowtracking) and hunting harvest of Wolves in the Belarussian part of BPF, exploited forests of the Polish part, and the strict reserve of Bialowieza National Park in 1946-93. Figure 5: Monthly distribution of Wolves killed by humans in 1980-93 in the Belarussian part of BPF. Figure 6: Fates of Wolves hunted in 1980-93 in the Belarussian part of BPF. Figure 7: Variation in the pack size of Wolves in winter in the Polish part of BPF (Wolves not hunted) and the Belarussian part (Wolves intensively hunted). Figure 8: Litter size of the Wolf in relation to the consecutive days of pups' life. Figure 9: Seasonal population dynamics of Wolves in BPF...in 1980-93. Appendix 1: Numbers and harvest of Wolves in the Polish part...and Belarussian part...in 1946-73.